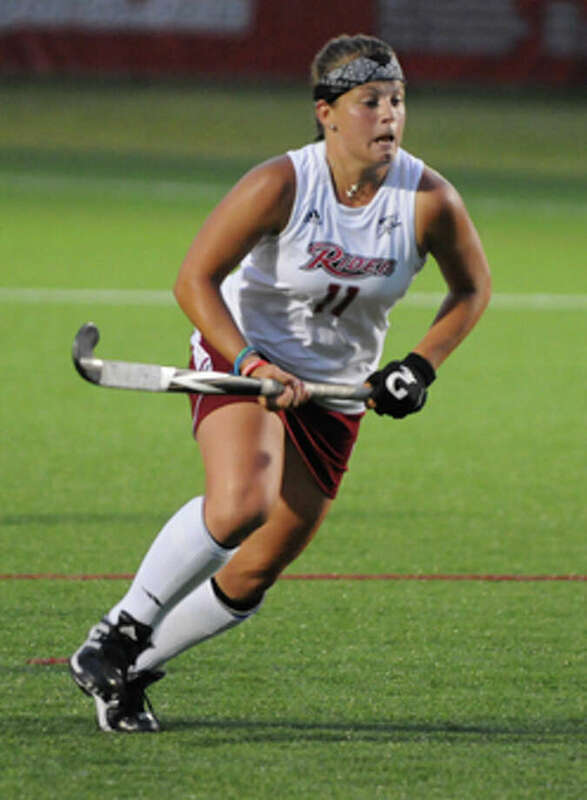 Former Warde standout Stacy Dileo recently finished a stellar four-year field hockey career at Rider University. Dileo started her final 68 games as the Broncs won three conference titles. When the time came to make the change, Stacy Dileo didn't need a lot of time to process it. She didn't just accept it, she embraced it. After a stellar freshman field hockey season at Rider where the former Warde standout played on the front line and scored five goals, graduation was taking its toll on the back line. Head coach Lori Hussong had a tough decision to make -- keep Dileo up front and take her chances next season with an untested face in the back, or move her to defense and use that experience as the anchor of the back line. Over the final three years at Rider, Dileo controlled the defense, helping to lead the Broncs to a second straight Northeast Conference title in 2012 and then a Metro Atlantic Athletic Conference crown in 2013. She also was named to the All-MAAC second team two straight years, leading Rider to 58 wins in her four seasons. "It was a pleasure to have her these last four years," Hussong said. "I don't think there's many players that come to practice everyday with a smile on her face like she does and works as hard. She's such a team-oriented kid." That was evident at the end of her freshman season when Hussong moved her to the back line after being the sixth highest scorer on the team. "It was different but I loved it and I like finishing my last couple of years playing defense," Dileo said, who played both softball and field hockey, along with two years of basketball at Warde. "I'm proud of everything I did but I liked finishing in the back. Defense normally doesn't get looked at as much because we don't score goals but I really liked being back there for my team and being able to direct things." For a player that had spent four seasons in high school playing up front and after scoring five goals (adding an assist) as a freshman, Dileo could have gotten frustrated over the position change and not worked as hard. Instead, she welcomed the change, first becoming a leader and then, this senior season, becoming a tri-captain, playing in 68 straight games over those final three seasons. "She just wanted to be on the field and she was willing to do whatever it took to be out there and make us be the best we could be," Hussong said. "When she came in as a freshman, we had a very, very strong team and I wanted to maximize her skills and so we put her on the front line and then, as kids graduated, we needed her on the back line, so she's played defense, primarily for the last three seasons. "It may not show in her stats but she does a tremendous amount of work for us, getting interceptions and passing the ball to someone up front. Those things have helped us win a lot of games. Her forte for us has been her defensive skills and her interception skills, getting the ball out of our end and being able to pass the ball hard enough to clear it out of the zone." After deciding to make field hockey, not softball, her sport of choice in college, Dileo had to decide where to go. As tempting as Fairfield University was, it was too close to home. And after Rider made her feel like one of the team on her official visit, the decision was an easy one. "When I came to Rider (for my visit) the team was just like a family here. Lori and (assistant coach) Dan (Hussong) are married, so they're basically like our mom and dad when we're here. They make sure we're all close. They have us over for dinner, that's what I really liked. "When I came for the visit, the team did everything together. I stayed over with the team, spent the night together. We talked, we hung out the whole night and I really enjoyed that. They wanted us to feel comfortable and welcome. It's like your home when you go over for dinner. It's a really nice feeling." game. A 15-6 record followed, along with a second straight NEC tournament crown and a second straight NCAA-play in loss, this time to UMass. The Broncs went 13-7 in Dileo's junior season, winning the MAAC regular season title before ending the 2014 campaign with an 11-9 mark, reaching the MAAC tournament finals before falling to Monmouth. "We had a rocky start but we knew going into the season that it would be a transition year," Dileo said. "We had eight freshmen and just three juniors and three seniors, so we knew it would be tough and that we'd have to work really hard but even though we didn't win, we reached the championship game when we weren't expected to." Thanks, in a large part, to Dileo's leadership and experience as a captain. "We had a very young team and just to get to the (MAAC) finals was a big accomplishment thanks to Stacy and the other two seniors leaders on the field," Hussong said. "We needed her play and leadership on the field and she did a great job in leading a very, very young team." Dileo caught the field hockey bug in seventh grade when she joined the Fairfield PAL program. She had been playing softball for as long as she could remember, but she quickly fell for the athletic nature of field hockey and joined the Fairfield Woods Middle School team in eighth grade and then played four years at Warde. "It's so much different," Dileo said of field hockey. "I like the athletic part of it, you're always moving and running and everything. A lot of my summers growing up were dedicated to softball. I wanted to play (field hockey). I really miss softball but I don't regret my decision." Dileo will graduate with a degree in communications, speech and interpersonal studies. "It's basically a communications degree," she said. "I'm not sure what I want to do yet. My options are open. Maybe go to grad school when I figure out what I want to do." "I would love to coach field hockey or softball, either one because I'm having withdrawal from not playing right now," she said. "I'd love to keep one or both of them in my life. I watched the (field hockey) spring game and all I could think was, `I miss this.' That was the quickest four years of my life."